Sentences that begin with a pound sign (#) are directives for the preprocessor. They are not executable code lines but indications for the compiler. The preprocessor is executed automatically by the compiler when we compile a program in C++ and is in charge of making the first verifications and digestions of the program’s code. the #define directive defines an identifier and a character sequence that will be substituted for the identifier each time it is encountered in the source file. the identifier is referred to as a macro name and the replacement process as macro replacement. #ifdef allows that a section of a program is compiled only if the defined constant that is specified as the parameter has been defined, independently of its value. 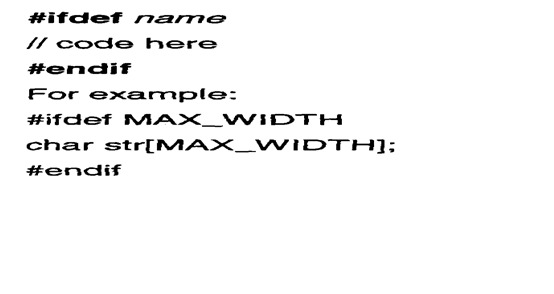 In the case given below, the line char str [MAX_WIDTH]; is only considered by the compiler if the defined constant MAX_WIDTH has been previously defined, independently of its value. If it has not been defined, that line will not be included in the program. #ifndef serves for the opposite: the code between the #ifndef directive and the #endif directive is only compiled if the constant name that is specified has not been defined previously. In this case, if when arriving at this piece of code the defined constant MAX_WIDTH has not yet been defined it would be defined with a value of 100. If it already existed it would maintain the value that it had (because the #define statement won't be executed). The #if, #else and #elif (elif = else if) directives serve so that the portion of code that follows is compiled only if the specified condition is met. The condition can only serve to evaluate constant expressions. Notice how the structure of chained directives #if, #elsif and #else finishes with #endif. The only difference between both expressions is the directories in which the compiler is going to look for the file. In the first case where the file is specified between quotes, the file is looked for in the same directory that includes the file containing the directive. In case that it is not there, the compiler looks for the file in the default directories where it is configured to look for the standard header files. If the file name is enclosed between angle-brackets <>the file is looked for directly where the compiler is configured to look for the standard header files.